I survived my daughter's 4th birthday. It may not sound like a big deal, but to me it is. Dubai is a place where everything can be bought for a party, be it decoration, photographer, entertainment, food, or a whole place to avoid a bunch of children + parent and/or nanny invade your place. Apart from the (very unhealthy) cake which I buy from outside and usually just gets slaughtered and not eaten (as kids just love the bright colors and parents are on a diet), we choose to do everything ourselves. Yesterday's party was not in any way different from the previous parties that we threw for our two kids. We dished up tested and approved music, games, foods for the kids. I managed to wow some of the accompanying adults with some Crispy Chocolate Walnut Cookies and Spicy Cocktail Nuts. My daughter, however, decided, that she had enough of the party after 45 minutes and rather wanted to play with her gifts upstairs in her room than spending time with the guests. Oh well. It was a roller coaster ride, and in the end, everyone had a good time. At some stage. I guess. Today I can still feel the party in my bones. It takes a lot out of me to try and make everyone happy while chatting nicely to the parents. I tried to fix myself with good food: lots of green stuff, fresh fruit, and nuts, no gluten, no grains, no sugar. Those are my recovery foods for whatever has to be recovered from. However, this spinach tart I made and ate sometime last week, to probably (unconsciously) prepare me for (the hardships of) the party. I finally managed to get the gluten-free pie/tart crust right. That had been the missing piece in this spinach tart for a quite some time. My daughter managed to eat a piece of this tart by gobbling up all of the tart crust, but left all the spinach filling on the plate. Husband took one bite and said it was too spinach-y. He prefers the Bacon Leek Tart. Oh well, one can't have everything... more for me then. Between two sheets of wax/parchment paper, roll out the dough in the shape of your tart pan. Remove the top sheet of waxed paper and take the remaining sheet with the dough and gently turn upside down onto the tart pan. Peel off the wax paper and gently press the crust dough into the pan and up the sides. If the dough tears, patch it back together by using small pieces of dough. Remove excess dough. Prebake for 15 minutes. 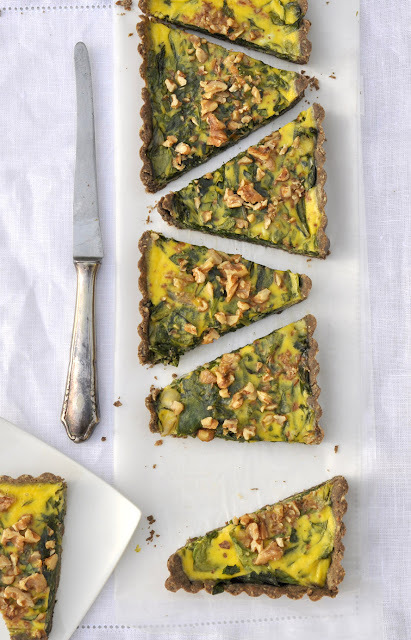 Transfer spinach into prebaked tart crust. Pour over the egg cheese mixture. Make sure the spinach is evenly covered. Sprinkle walnuts on top and bake for 20 minutes at 180C/350F, or until egg has set. Take out of the pan. Cut into wedges. Serve warm.